If possible, I remove my makeup using a cleansing product and fresh water. Here is something by Galénic I’m really fond of. On a daily basis, I tend to use eye makeup, so what I’d need is a cleanser which would help remove waterproof mascaras and eyeliners. “Pur” by Galénic is an airy mousse with sebum control and cleansing properties. I love it because it does not irritate my eyes and removes all makeup on my face, leaving it clean and rejuvenated. The gentle formula of the mousse contains Melilotus floral water – the active ingredient which cleanses dirt, excessive sebum and makeup, leaving my face fresh and glowing. I would totally recommend this product for its properties and pleasant after effect. Here’s how I cooled off in July. I used a favorite shower gel – Toning shower gel by Elancyl. Looking at the product and its color, you may think that it smells of natural green freshness and you will be right. This shower gel by Elancyl contains ivy extracts which help cleanse the skin and have strengthening and stimulating effects. The good part is that the gel contains no soap but still makes a big amount of creamy foam you will surely enjoy. It’s time for some quality cleansing! When it comes to face wash, I like soapy foams, rather than micellar gels. This mouse by La Roche-Posay is exactly the type which I’d like to own a bigger bottle of. It is gentle, soap and paraben free, removes heavy makeup and dirt instantly, leaving me feel just great! It is a product recommended for the ladies with sensitive skin as well. This calming fresh mask soothes and relaxes the skin to the maximum. If you experience the occasional irritations and red spots, this face mask with Calamine extracts would bring back the balance and your healthy look. I’d recommend it to the ladies with sensitive skin, who undergo stress and are in need of some “me” time. One word – Yummy! For a few weeks, I was obsessed with applying this delicious balm on my lips. I love its fruity watermelon smell and sweet taste! The balm is handy and fun to apply with its rotating cap. Its texture is gentle, rich and moisturizing with natural cocoa butter, vitamin E and watermelon extract. Great product for the summer! Talking about the seaside, do you often have dry lips as a result of the strong sun? I find nothing better than the organic cocoa butter to help prevent that. This affordable and very handy lip balm helps protect the gentle skin on my lips while keeping them moisturized and super soft. Reapplication every two hours ensures for a good sun protection with a 30 SPF, decreasing the risk of skin irritation and aging. Here’s a product I didn’t think I’d really fancy. Pure Shea butter with no smell or attractive package. This product screams organic. But why not give it a try? Shea butter is known to be perfect for dry and cracked skin. It keeps the skin’s elasticity, protects it from wrinkle appearance, stretch marks and dehydration. I would use it on my heels, elbows and sometimes as a hand cream, too. It is great for all skin types and definitely has a place in my skin care product stash. It’s great for massages as well! The lemon freshness I was using every day during my seaside trip. Take a shower and apply right after all over your body. It is a better idea if your skin is still wet, so as the oil can soak in better and faster. The instant feeling of nourishment and the delicious smell of sweet Corsica lemons leaves me happy and refreshed. Read the complete review on the body oil here. 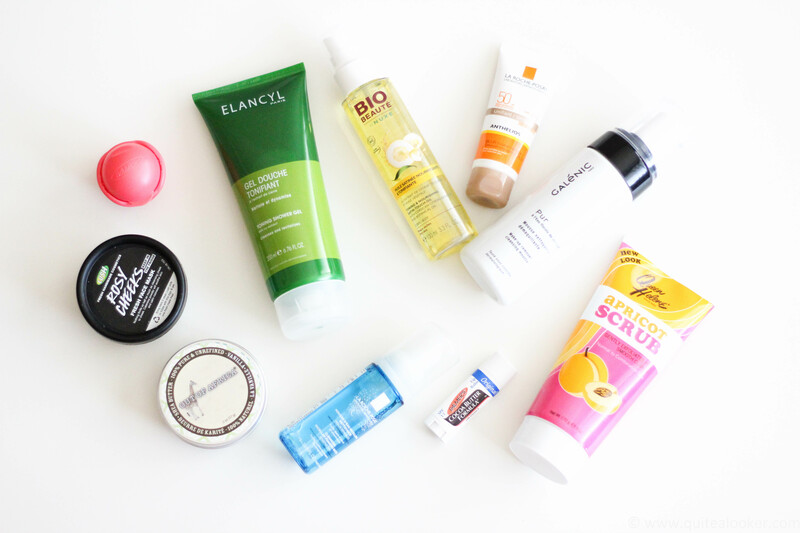 The sunscreen mousse I fell in love with this summer! To be honest, I don’t really use much sunscreen for my face. What I’d usually do is stay in the shade and hide under a wide brim hat. The reason was I hadn’t yet stumbled upon the right product which would both protect, but also make my face skin look and feel good. Anthelios Unifiant is exactly this product. It provides tanned complexion and healthy glow and is ideal for even the most sensitive skin types. I love its light texture and color which matches my skin perfectly. What I am using is the shade in golden brown. It is hard to find the proper scrub that is gentle enough for the face but also good enough for the body. This one does the trick. If you have normal to combined skin and are in need of a good scrub, give this one a try. I wouldn’t recommend it to the ladies with sensitive skin, though. In the hot summer months, taking proper care and scrubbing off dead skin is a must! I love all of these – all these scents smell amazing.